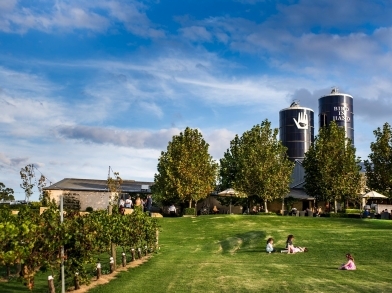 The cellar door at Bird in Hand is open seven days a week for visitors to drop by and enjoy a tasting. Visitors can taste a range of Bird in Hand at Two in the Bush wines, or if they favour a more personalised experience can opt for a special Nest Egg tasting in a reserved and private area, for $25pp. At the winery, visitors can wander through the original barrel hall, relax in the courtyard overlooking the vines, taste our olive oil, or enjoy bites of cheese and antipasti. Charcuterie and Cheese boards to share are available between 12pm-4pm every day. Or book a table in The Gallery, the onsite restaurant, open for lunch every day. Group bookings are essential for 8 or more people.